You don’t have to be big to do big things. – Piglet isn’t very big in size, but despite his small stature, he often comes through in pretty big ways for Pooh. Piglet will surprise even himself with what he’s able to do in the name of friendship. You can act bravely even when you’re afraid. – Things in life may scare us, and that’s OK; but we don’t need to let those fears keep us from acting bravely. We can face our fears and rise to a challenge, and Piglet shows us how to do that. Friends can help us to overcome our fears. 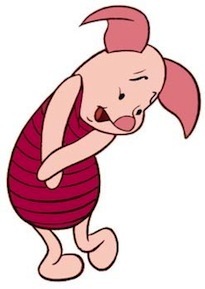 – It’s Piglet’s nature to be skittish and unsure, yet he has been the hero in some pretty tough spots a lot of times. His friendship with Pooh and others in Hundred Acre Wood helps him overcome his fears in order to do what he knows needs to be done. Things aren’t as scary as they seem once we face them head-on. – Something happens when we face that fear and not back down. Big scary things tend to shrink down to our size. We don’t fear them quite as much anymore, and learn how to deal with them better the next time around, thanks to Piglet. Friendship means going outside one’s comfort zone to help another. – Piglet’s friends mean more to him than his own safety or comfort. That helps him do things he might not be willing to do otherwise. He teaches us the importance of friendship and the power of love. The size of your heart is more important than the size of your body. – Piglet shows us that it’s what’s inside that counts. No matter what someone looks like on the outside, if their heart is big, then they too are truly big, in far more important ways. There is nobility in helping others. – When Owl loses his home, Piglet agrees to let Owl have his home – “a noble thing” and moves in with Pooh in order for Owl to have a place to live. He chose to give up his “very grand house” for the sake of a needy friend. Start your day with enthusiasm. – Piglet begins every day asking himself, “I wonder what’s going to happen exciting today.” We can live much happier and productive lives when we approach every day as another opportunity to discover something exciting and new. You can always brighten someone’s day with a balloon. – Piglet loves balloons, and brightly colored things. His optimism always outweighs his fears, and the results are typically contagious. He brightens the day of everyone around him. It pays to be neat and tidy. – Piglet can always be counted on to be there when you need him, and have something you need; because he keeps everything in such fastidious order. It also gives him more time to spend with Pooh, or to visit Christopher Robin.